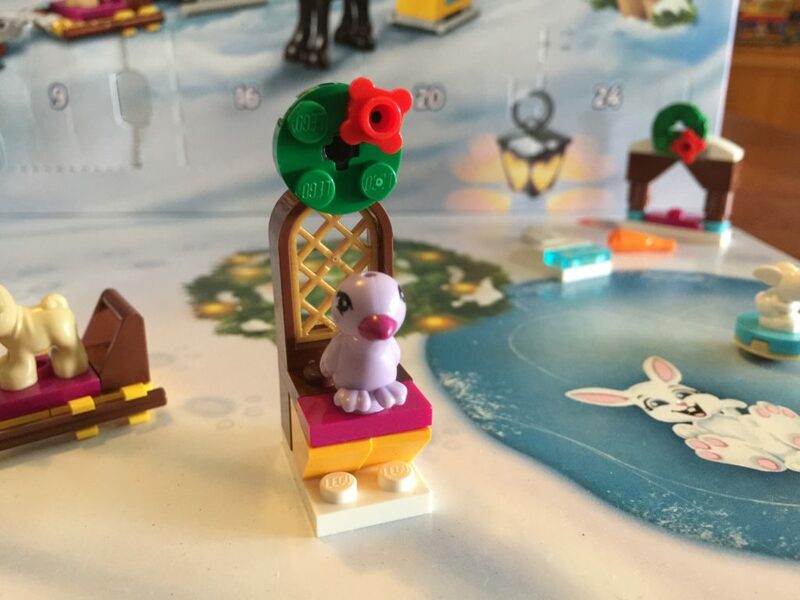 As per usual, with all three of the 2017 Advent Calendars, I’ll be updating this post daily. Each day will have an image of the day’s build, a quick comment, with a final overall review at the end of the month. If you want to keep up to date with the post, use the link to the right of the page – it’ll be there for the duration of December. I won’t be posting any pics on social media, so it won’t get spoilt by me! 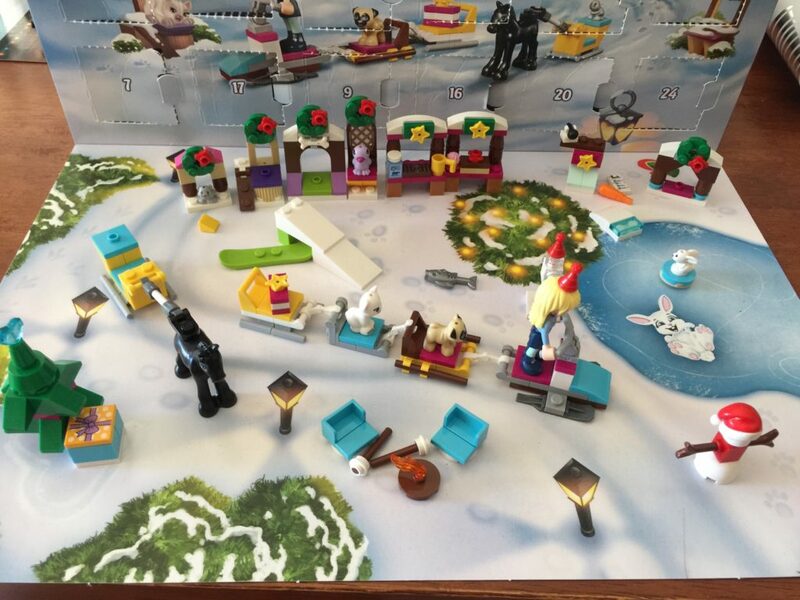 As with the City calendar, there’s a lot of spoilers on this box. It’s a shame! 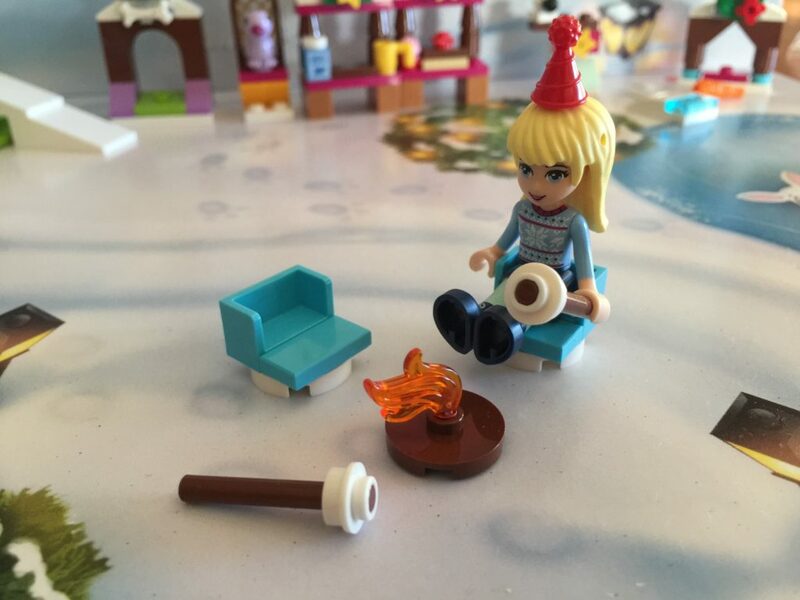 There’s also only one minidoll this time around – it looks like a lonely Christmas for Stephanie! This year the display is much simpler. Some trees and snow, a frozen lake, and a bunny! Lots of room to arrange things how you like. 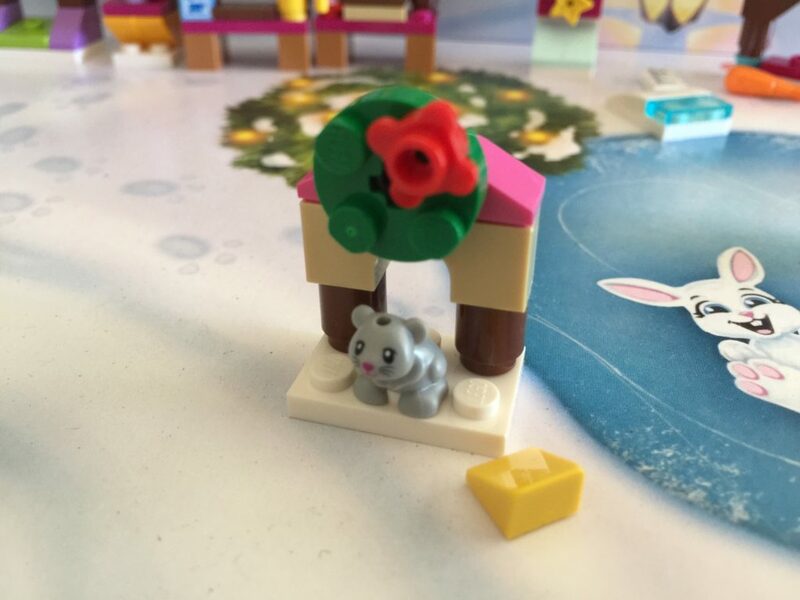 First up we’ve got Stephanie, the only minidoll in the calendar. 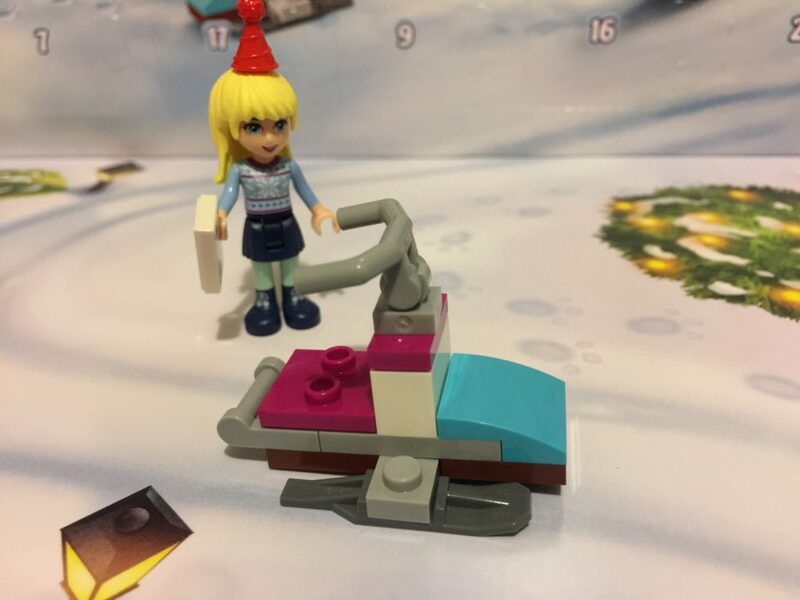 I personally think this is great – I don’t really like the minidolls, so the more non-minidoll LEGO parts that aren’t them, the better for me! I’m sure there are loads of fans though, so it’s a shame that there’s not more for them. 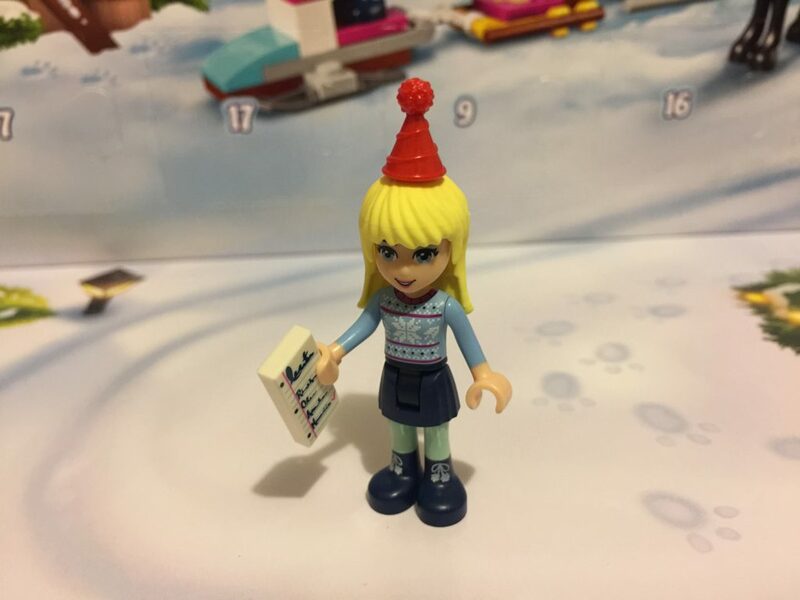 Advent calendars are often good for new outfits. I do like the red party hat and list, and the printed sweater and tasselled boots are also very cute. Well this is interesting! 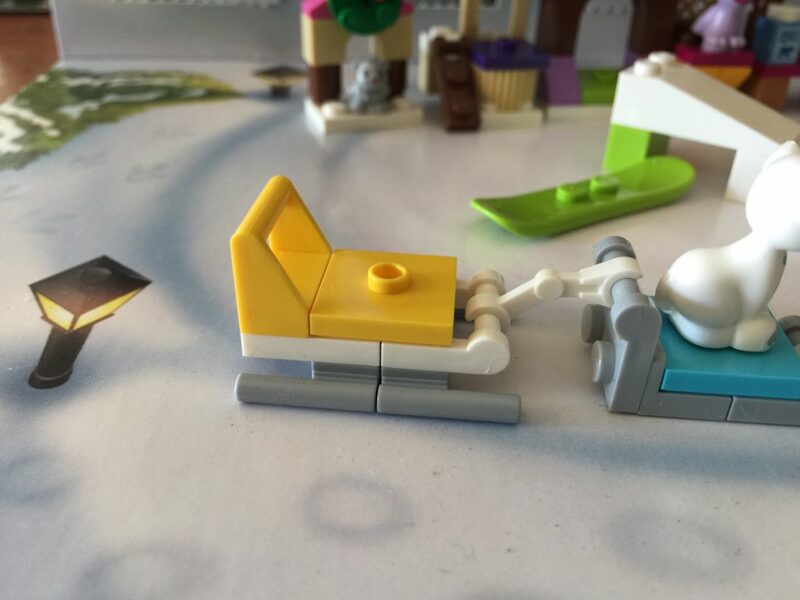 It’s a very strange looking sled, but it works! Stephanie can stand on the jumper plates and hold on to the handlebars. It’s a little back heavy as you can tell, but it looks like a lot of fun. It also looks like there’ll be trailers coming soon. I think this is an empty fireplace, or at least an arch. I feel it’s slightly unfinished. 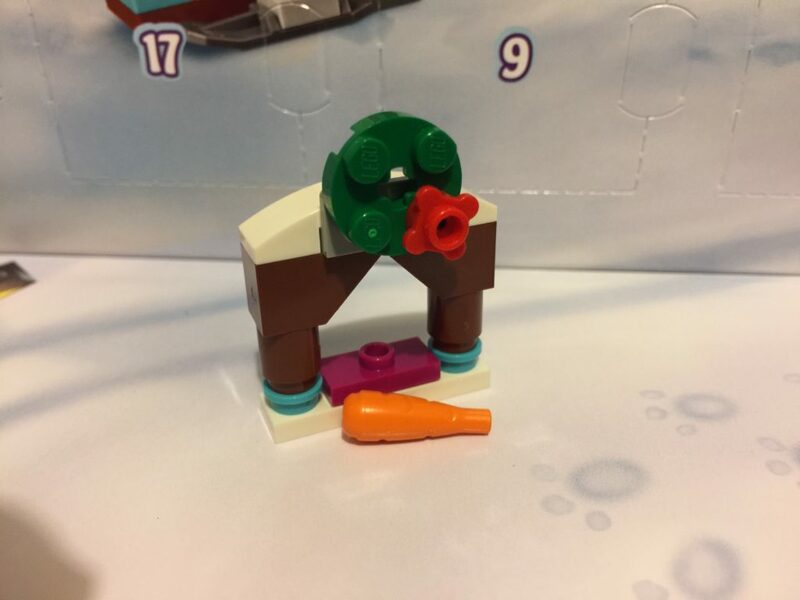 I like the wreath and the carrot is a great inclusion, after all, reindeer have to eat, but I would have liked to see a 2×4 plate underneath, as it’s a bit front heavy due to the wreath. When my wife opened the packet today, she was bitterly disappointed. Ready to build something, and then there was just a pug. 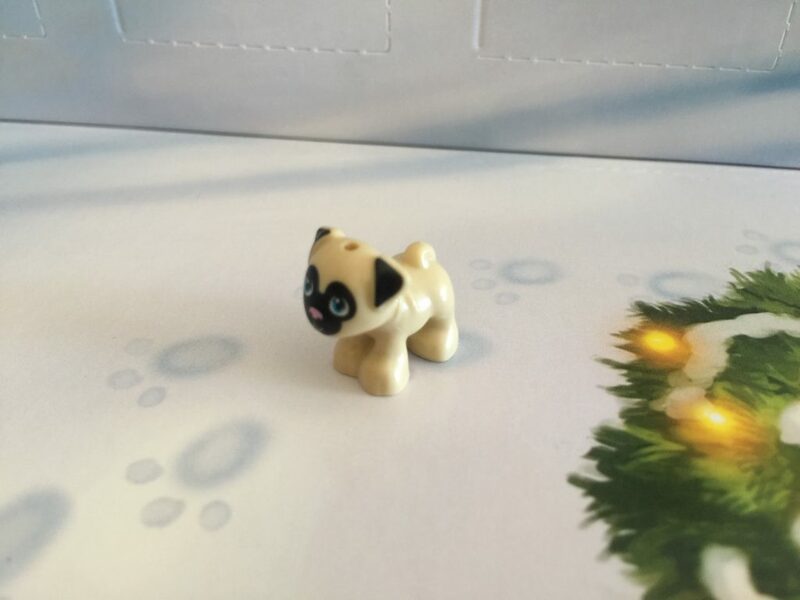 Now, LEGO pugs are incredibly cute, and quite rare, only appearing in three other Friends sets, but it’s a bit of a let down when there’s nothing to build. There’s going to be a couple more of these I think, but hopefully tomorrow is better. It’s another simple build today, but it’s not all bad. 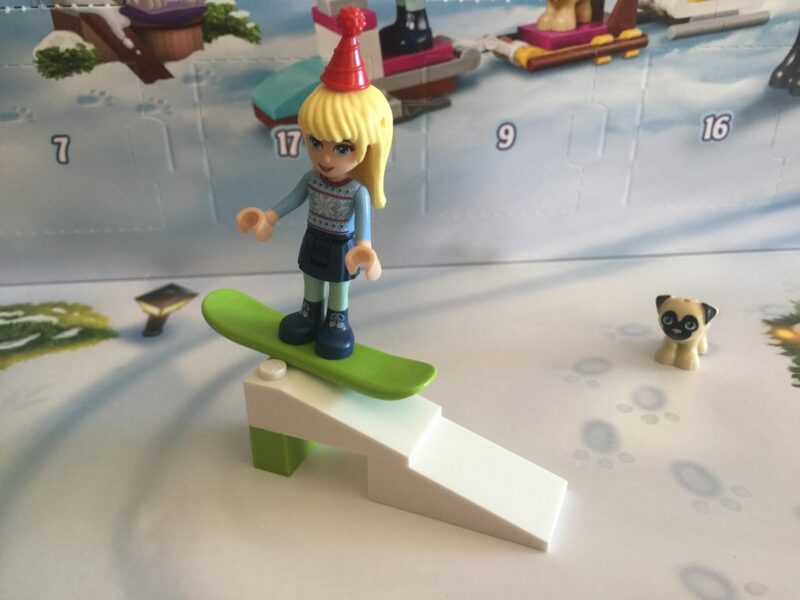 The lime green snowboard is relatively rare, appearing in only three other sets – two from the Snow Resort subtheme of Friends this year, plus a new City set for next year. The rest of the elements are pretty bog standard, but we get a newish snowboard, so I’m happy. We’re back with a proper (ish) build today with a puppy place for Toffee. 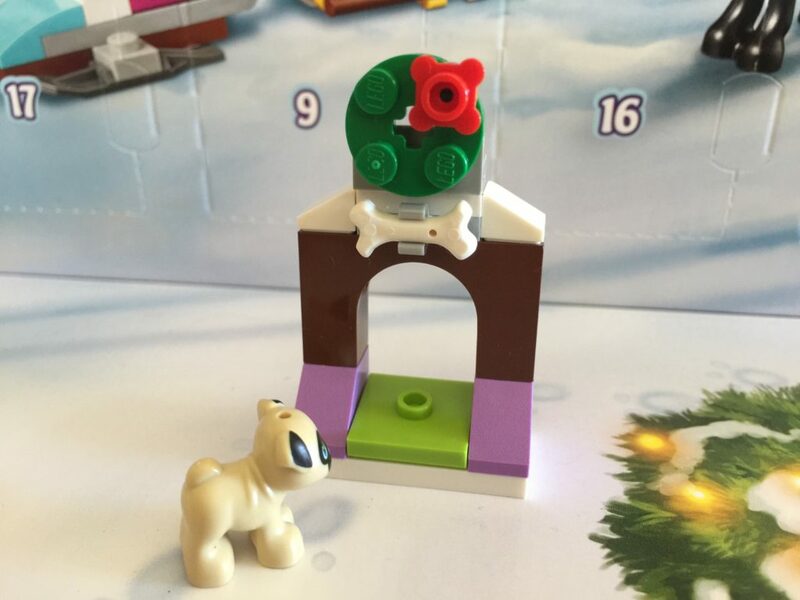 It”s quite basic, with similar details to Day 4’s arch and wreath. I like that it’s got a 2×4 plate as a base, so it is more stable, and we get a rare arch. 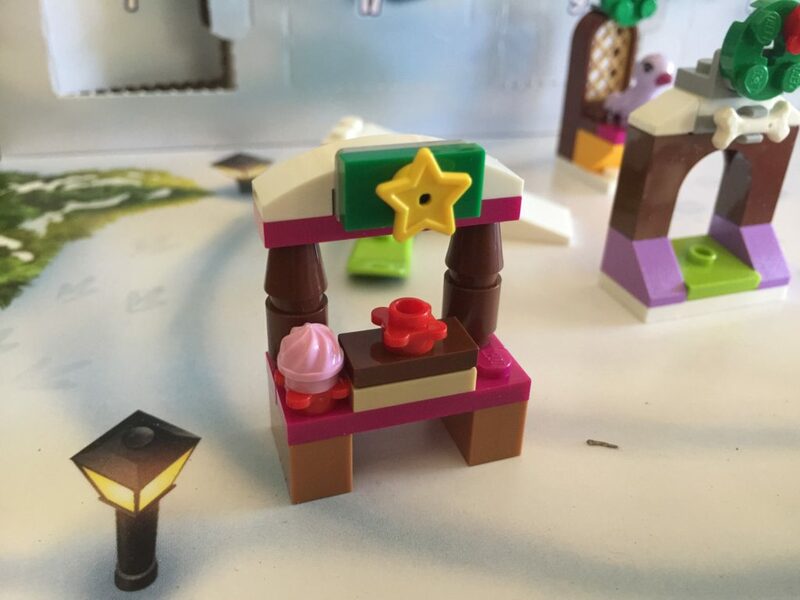 The 1x4x2 arch in reddish brown has only been seen in one other set – 41143 Berry’s Kitchen from this year’s Disney theme. Not only does Toffee now have a shelter, but he’s got transportation! 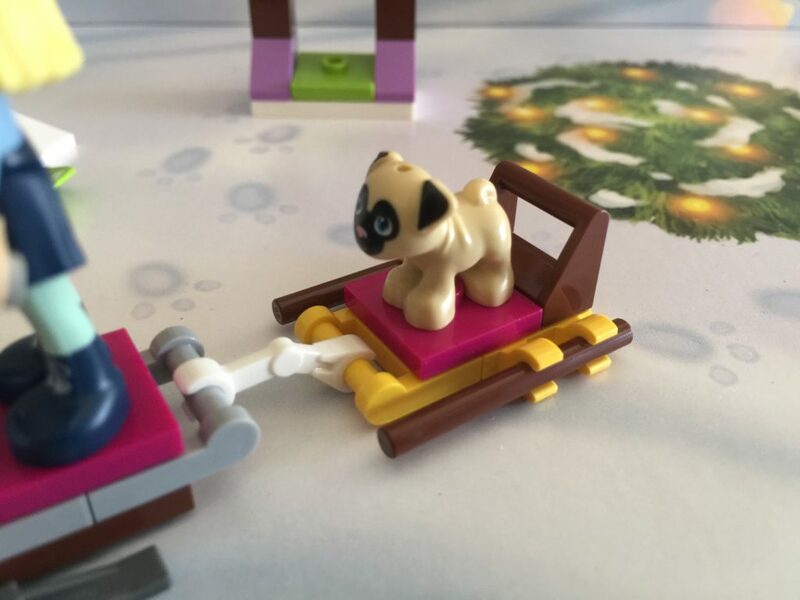 Today we get a sled for him to be towed around behind Stephanie’s sled. I really like the look of this build. It’s simple, and has some great colours. Easy to build, and my wife was quite happy with this one! 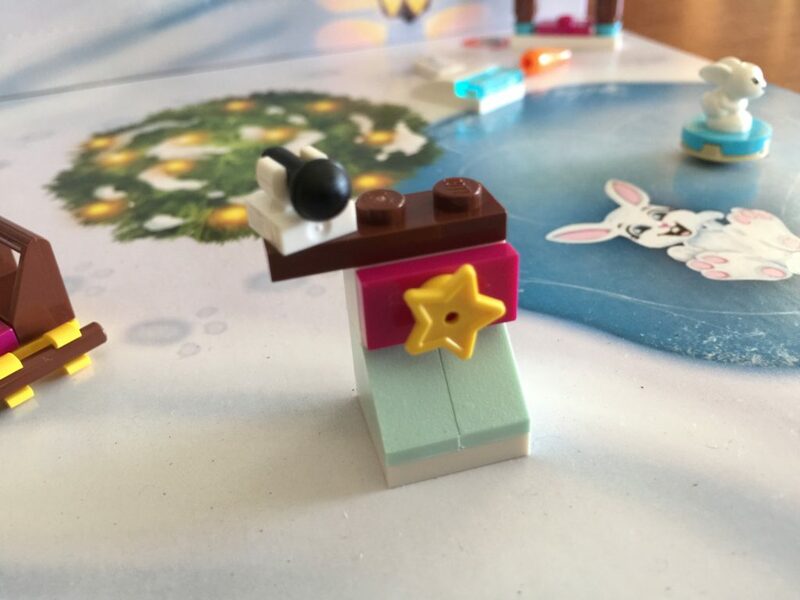 Today’s build is another rather strange build for an advent calendar. I get that Stephanie is alone and needs pets to keep her company, but the only thing making this Christmassy is the wreath. I don’t think it’s enough. The warm gold grille is good to have, and this variant is a little rarer. 30046 has been seen around for a while, but this version, 29170, has a square section taken out of the middle. I have no idea why, but it’s visible just above the bird’s head. The lavender coloured bird is also quite rare, having been seen in only 41110: Birthday Party. All in all, not too bad, but still an odd choice of festive build. I totally agree. It’s really disappointing. I get the cliche with Friends, but it doesn’t mean we have to have this. I don’t reckon kids would even know what this is. Hopefully tomorrow is better. Today we’ve got a very mysterious stand of sorts. Is it cake? Is it flowers? Presents maybe? Nobody knows. What I do know is that I’m starting to get sick of these random stands in this calendar. 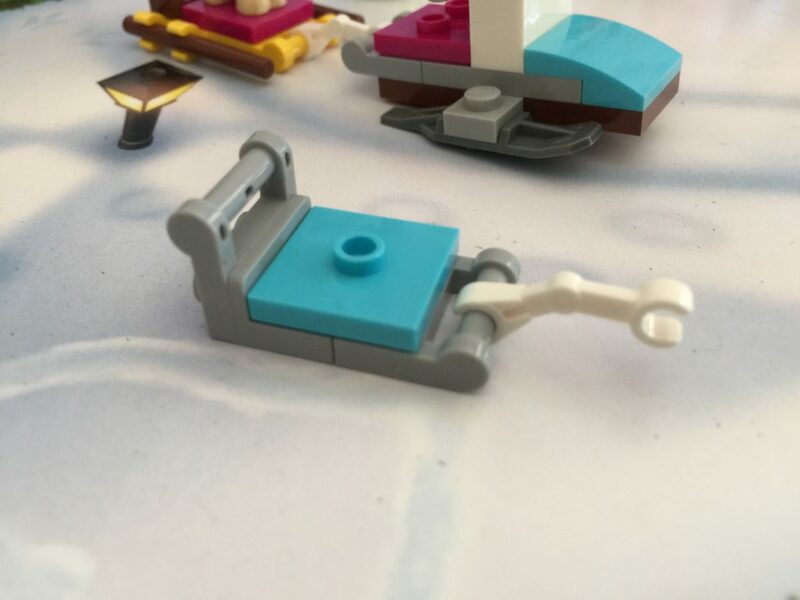 C’mon LEGO, you can do better than this. Yeah, the construction isn’t too bad, but it’s still another stand. 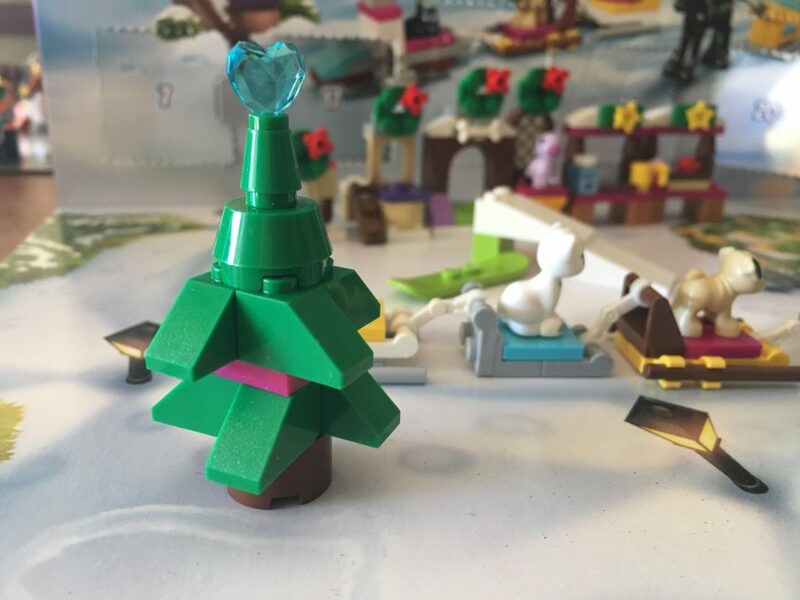 Surely there’s more happening in Heartlake City than random stands at Christmas. Obviously not. There’s just stands! 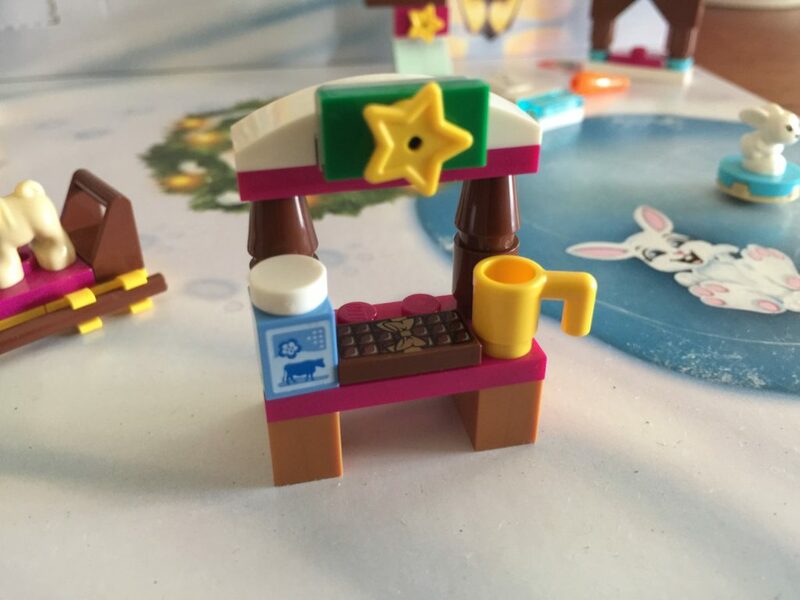 This Hot Chocolate stand has (in my eyes) at least got two redeeming features – the milk and bar of chocolate. I’ve got a few milk bottles now, but I’m always happy with more, but none of the chocolate bars! 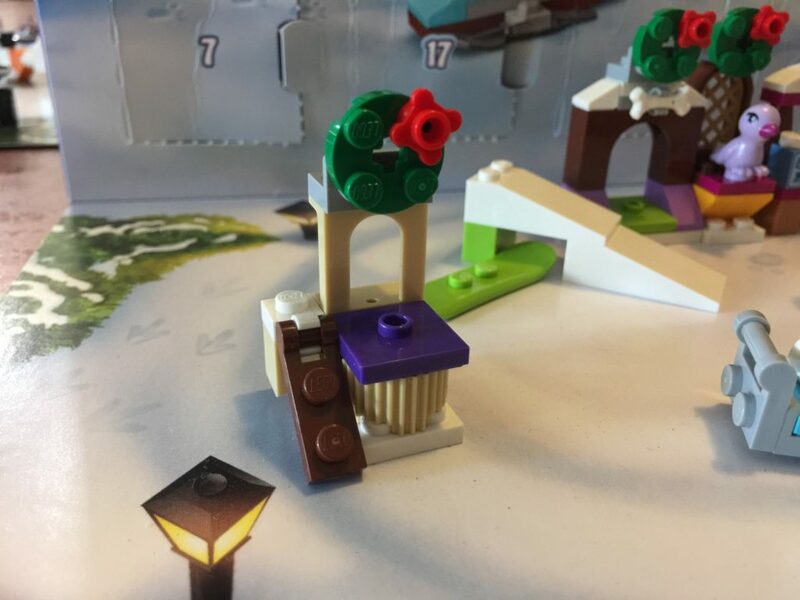 These were only available in Friends and Elves sets, as well as a couple of Frozen sets and this year’s Valentine’s seasonal set, of which I have none, so I’m very happy! But seriously. 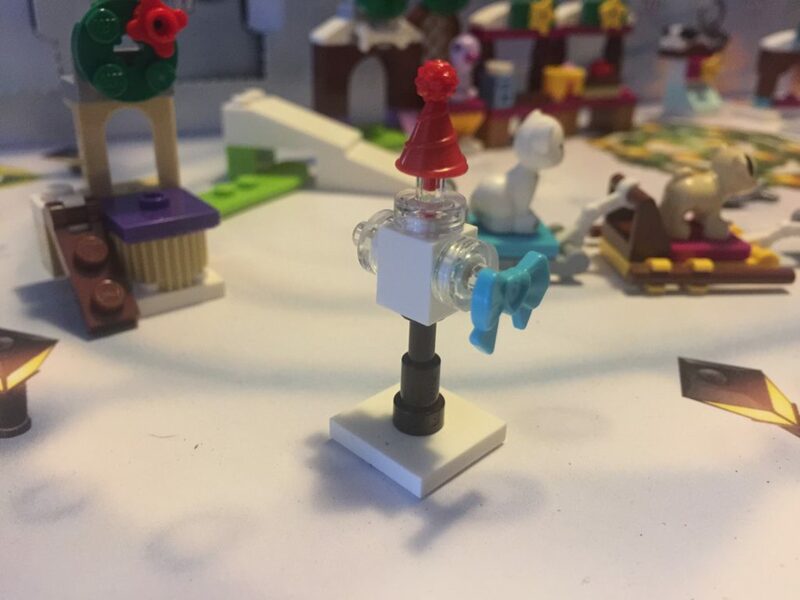 Please, LEGO. Please, no more stands! We need variety. 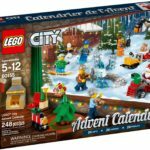 It appears LEGO has finally clued in that endless stands do not an Advent Calendar make, so we’ve got something different! Hooray! It’s actually not too bad. I like the seats, using an azure double corner wall 1×2 as the main element, and the marshmallows and sticks are great. The fire is small, but good for this scale. All in all, this is a good one. So far, this is my favourite, and it’s very simple, so that’s saying something! Today is another disappointment, as I don’t think it’s complete. It’s a trailer. By the looks of the spoiler on the cover, it’s for the bird we received on Day 9. It’s nice that it’s not a stand, but I think it could have been a little more exciting with some more flashy parts as greebling. Something (anything) to spruce it up a bit. At least there’s a little SNOT in there! Ugh. I’m getting really sick of the repetitiveness of this calendar. Once again, we have another arch based build. This time it’s a hamster house. The hamster is good to have, as it’s quite rare (a Friends set from 2016, and a free gift Friends set), but it’s not enough. These builds are near identical. 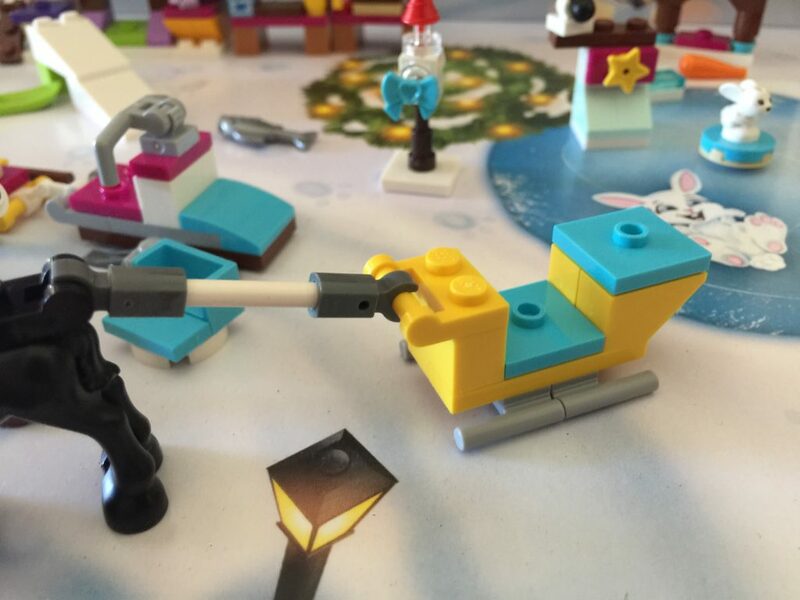 Not cool, LEGO. If it’s not a sled or an archway thing, it’s this – an animal (sorry about the shocker of a photo). It’s another dull day in December in Heartlake City. 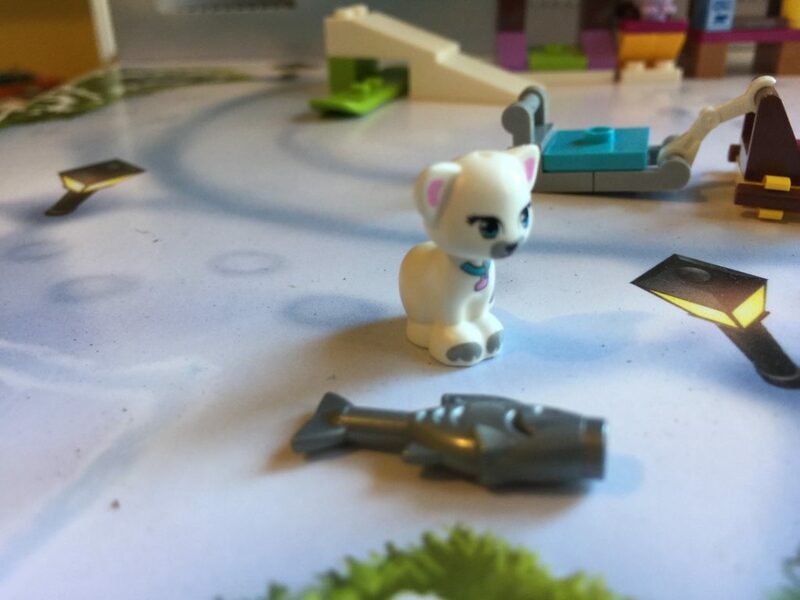 The cat’s been around the city since 2013 and appeared in 2014’s Friends advent calendar, so it’s nice to have, but it needed to have something else. Not a hutch or a sled though. Anything but that. It’s yet another stand/arch type build today, but for once I don’t mind it. It’s a little house for the cat we got yesterday. complete with ramp for easy kitty access and what I think is a scratching post underneath the purple cushion. It’s simple, but I quite like it. It’s another sled today, which is no surprise. At least this one is a little better design-wise. 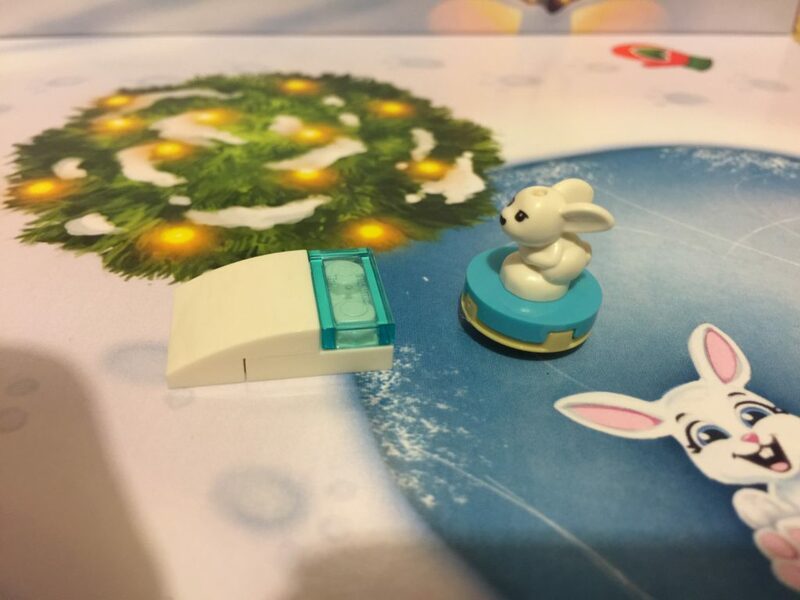 It’s got sled tracks! That’s really all it’s got going for it though. I am so disappointed with the calendar this year. There’s so much potential for awesome, but it’s totally missed the mark. Five days to go – maybe it will redeem itself, but I don’t think so. Yesterday we got the Christmas Tree, today we have something to put underneath it! I really like these little presents. We got a similar build last year which I liked, so seeing them again was very welcome. The bigger box can be opened to reveal a transparent blue heart inside. 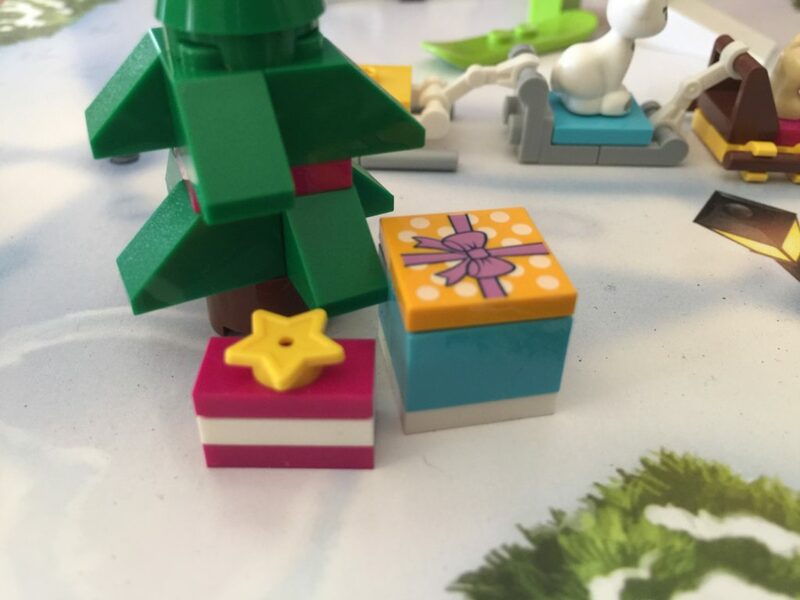 It’s great fun for the kids to be able to open the presents to find something waiting for them. 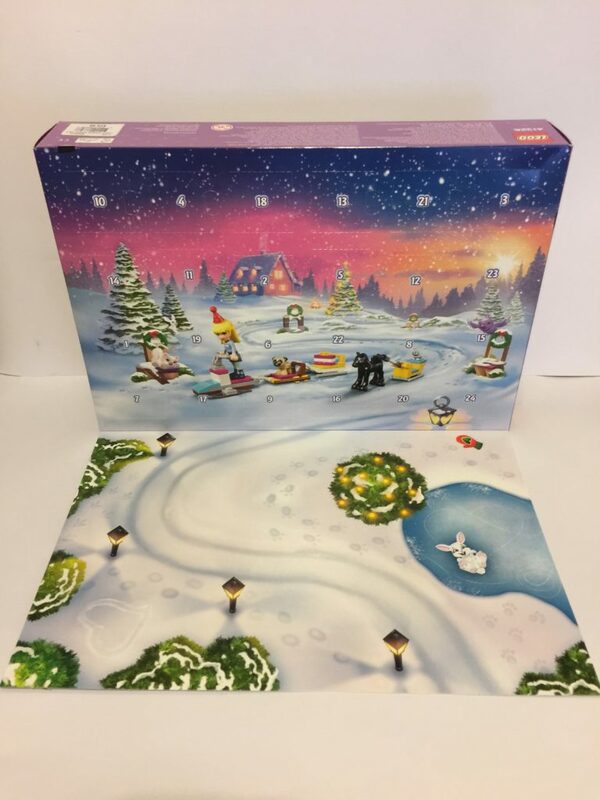 The lids are still relatively hard to find, appearing in only six other sets, one of which being last year’s Friends calendar. Today’s build is not a build. It’s not even one you have to open a bag for! It’s a little foal. 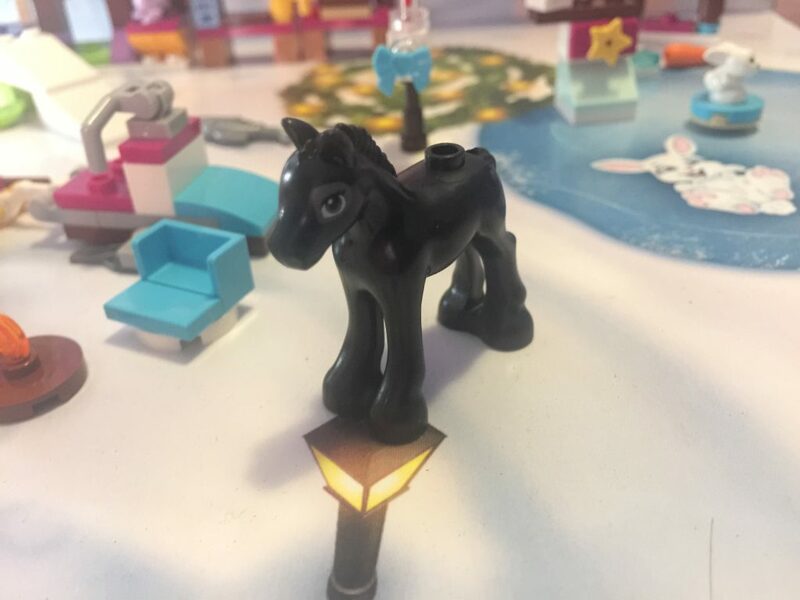 This element is very rare, only appearing in 41123 Foal’s Washing Station from 2016. I like it. Not much else to say about this one! 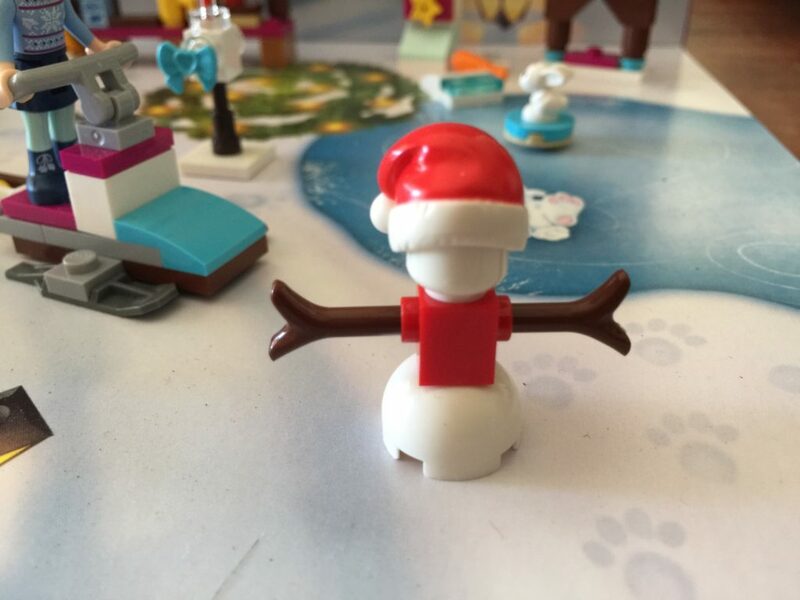 We’ve reached the end of the Friends Advent Calendar and to finish it off we have a Santa Snowman. We’ve seen these plenty of times before, so it’s not all that exciting, but at least it’s not an arch or an animal. We’ve made it to the end. 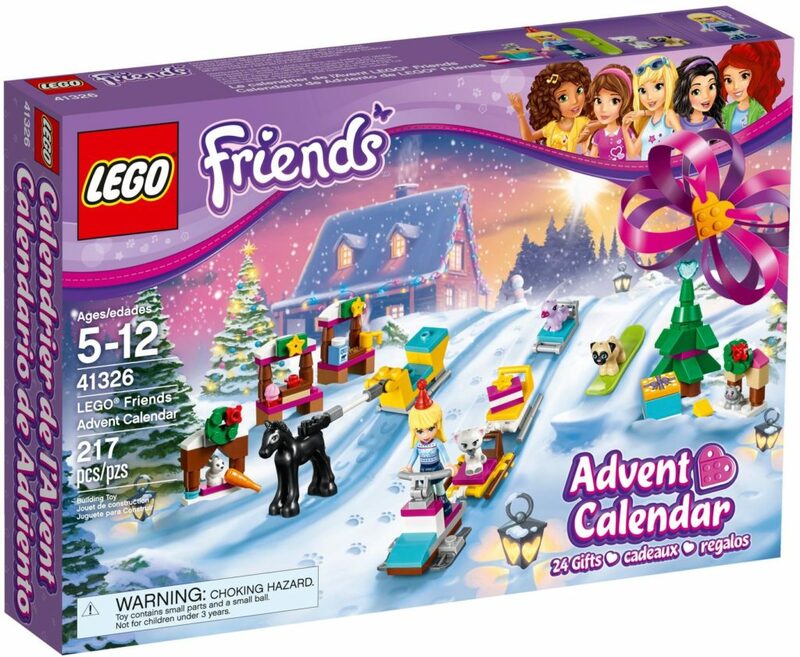 The Friends calendar was a big disappointment this year which is a real shame, as it could have been so much better if it had tied in with the other 2017 Friends releases. There’s been repetition all over the place, with five similar arches, four similar sleds and four essentially animal-only builds. That doesn’t leave much else. In fact, that only leaves nine other builds and they weren’t that exciting either. The best one (and that’s a stretch) was the cat stand from Day 17, and there’s too many to choose from for the worst. There really is. It’s a shame, but I’m glad it’s done. Maybe next year will be an improvement. I certainly hope so. Did your thoughts on this match mine? Let me know below.